In her early thirties, Rachel was diagnosed with serious depression and subsequently suffered two major depressive episodes. These two episodes have become the defining events of her life. Since then, she has written about the condition, and how she has recovered, in books that have been read by tens of thousands of people. Her memoir about her experience of serious depression Black Rainbow was a Sunday Times bestseller . Rachel now speaks publicly about her experience of depression and recovery in an effort to reduce stigma and educate people about the reality of mental illness. She also runs workshops for mental health charities to share what she has learnt about how to stay calm and well. I heard about the agency through a novelist friend of mine who is part of my book club. Rachel Kelly’s new book Walking on Sunshine is up to No.3 in the Amazon bestseller list (and no.2 in ‘Movers and Shakers’). Congratulations to Rachel Kelly whose Walking on Sunshine: 52 Small Steps to Happiness is no 1 in BestMind, Body & Spirit Self Help on Amazon. Her appearance today on Lorraine Kelly can be seen here. 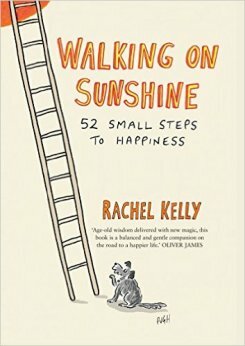 Congratulations to Rachel Kelly whose self-help book Walking on Sunshine: 52 Small Steps to Happiness went to no 4 on Amazon over the weekend. 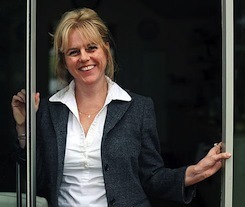 Rachel Kelly will be a guest on the Anne Diamond show today on BBC Berkshire, discussing her book Black Rainbow. Rachel Kelly has written a fascinating article for the Daily Telegraph on the healing nature of poetry. Rachel Kelly has written a piece in praise of mothers, in The Oldie. Rachel Kelly has contributed to an interesting piece in the Telegraph on working women. Rachel Kelly has written a fascinating piece on women and antidepressants in the Sunday Times. There was a good review for Rachel Kelly’s Black Rainbow in the Telegraph this weekend, and Rachel also featured on BBC radio’s The Why Factor, which you can listen again to here. The paperback launch of Rachel Kelly’s Black Rainbow was covered in the Evening Standard. The book won the Spear’s First Book prize. Congratulations to Rachel Kelly who has won this year’s Spear’s prize for Best First Book. William Cash, editor-in-chief of Spear’s, said Rachel’s memoir ‘Black Rainbow: How words healed me - my journey through depression’ tackled the difficult but important subject of depression and was a powerful and moving account of how Rachel used poetry to overcome her demons. Rachel’s book was published by Yellow Kite, a subsidiary of Hodder & Stoughton in April and comes out in paperback on 9th October. Rachel Kelly was interviewed last weekend in Ireland’s biggest newspaper, the Sunday Independent. Rachel Kelly is on the front cover of the Catholic Herald, which features her powerful long piece on life-saving prayer and poetry. Rachel Kelly’s video with actor Dominic West - about depression, the healing power of poetry, and Rachel’s new book Black Rainbow - is now online. 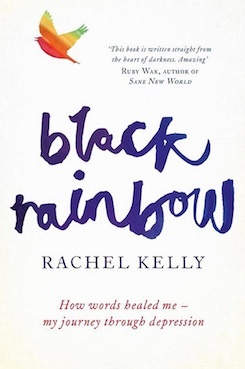 Rachel Kelly’s powerful memoir Black Rainbow is at number 8 on the Telegraph bestseller list. Black Rainbow is out now. Rachel Kelly’s husband gives his perspective on Black Rainbow in the Standard. Mayor of London Boris Johnson wrote and performed a poem in tribute to Rachel Kelly at the launch of her new book Black Rainbow. Following Rachel Kelly’s appearance on Loose Women, her powerful memoir Black Rainbow: How Words Healed Me: My Journey Through Depression moved into Amazon’s Top 100 bestsellers. The second serial in Rachel Kelly’s memoir about her depression Black Rainbow is in the Mail on Sunday’s You Magazine. Rachel Kelly’s Black Rainbow is serialised in the Times Magazine today, alongside an interview with the author.